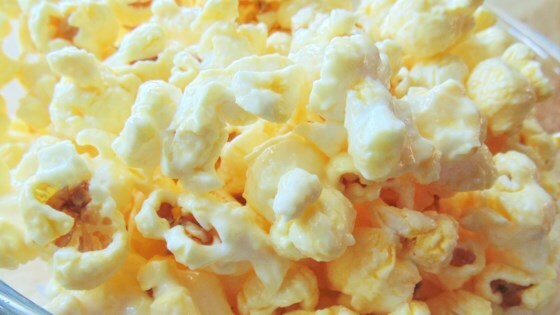 "A yummy twist on normal buttered popcorn that is quick to make and oh so good! Almond bark is slightly sweeter than white chocolate and just melts in your mouth. You can make this recipe festive for any holiday by adding any color sprinkles while popcorn is still warm. Wait until it is completely cooled before breaking it up and storing it." Place packaged popcorn in the microwave; cook on high until popping begins to slow down, about 2 1/2 minutes. Pour popcorn into a large bowl. Remove any unpopped kernels. Place almond bark in a saucepan and melt over medium-low heat, stirring constantly so it does not burn on the bottom, about 8 minutes. Pour melted almond bark over popcorn and stir to coat evenly. Pour out onto a baking sheet to cool.